This apartment is situated just over ten minutes’ walk to the famous Las Ramblas and Plaça de Catalunya, the city’s main square, and offers free WiFi. It is located just 5 minutes’ walk from Universitat and Sant Antoni metro stations. The apartment sleeps up to 4 people across two bedrooms, one containing a double bed and the other two single beds. There is an open-plan kitchen, living and dining room with a large flat-screen TV and dining table. The kitchen includes a microwave, kettle, coffee maker, oven and toaster. 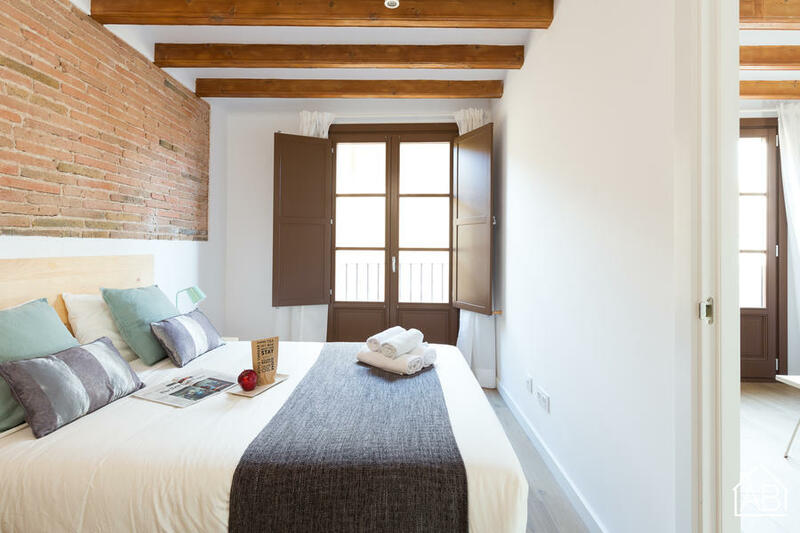 It is located just 650 metres from Barcelona’s famous La Boquería market and under a 15-minute walk from Passeig de Gràcia, home to Antoni Gaudí’s Casa Batlló and Casa Milà. The Museum of Contemporary Art (MACBA) and the Centre of Contemporary Culture (CCCB) are both under a 5-minute walk away and based in the Old Town, there are plenty of other attractions to explore just a short walk away including Barcelona Cathedral, Palau de la Música Catalana and the Picasso Museum. The Old Town is a great choice for those interested in architecture, museums, local culture, landmarks and city stays.